Betty Jane Holderman, 88, of Elizabethtown, died Monday, July 30, 2018 at Hardin Memorial Hospital. She was a native of Mercer County, a member of Gilead Baptist Church, and retired after 20 years from Hardin Memorial Hospital as the catering manager. Her and her husband worked in New Mexico Missionaries, Oneida Baptist Institute and Southern Baptist Home Missionaries. She was preceded in death by her husband, Rev. Joseph Harold Holderman; her parents, William and Opal Shackelford and a brother, Kenneth Shackelford. 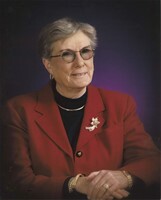 She is survived by three daughters, Vicki Ann Dareing and Kathy (Connie Reed) Holderman all of Elizabethtown, and Betty Jo (Ron) Mitchell of Radcliff; a sister, Patsy Ann Gray of Harrodsburg; three grandchildren, Joseph Brandon Crain, Krystal Simpkinson, and Christina Welch; and five great grandchildren, Danielle Faith, Erickson Ash-Lee, Victoria Keira Paige, Allanah Louise, and Gryphon Rhys. The funeral is Thursday at 11 a.m. at Brown Funeral Home with Bro. Mike Bell officiating. Burial will follow in Bethlehem Baptist Church Cemetery in Springfield, KY. Visitation is from 4-8 p.m. Wednesday and continues after 9 a.m. Thursday at the funeral home. Expressions of sympathy may take the form of donations to Oneida Baptist Institute. Condolences may be expressed online at www.brownfuneral.com.